Romano, R.; Beltran, L.; Roca, J. The Spanish Mediterranean coast has shown, since the rise of tourism as a major economic activity, being one of the geographic areas with higher growth dynamics of developed land. Proof of this is the high percentage of land occupation that has taken place in the first 500m of the coast, with up to 40%. This current situation has driven this study, aiming to find out what has been the involvement of tourism activity in land consumption. That is, how it affects the continuity, fragmentation, density and land use of urban growth patterns on the coastline and what is its level of impact, depending on the distance of these urban systems from the coastline. The result suggests that the influence of tourism on the spatial distribution favors urban sprawl, being location one of the most important forces. Romano Grullón, Ramona Yraida; Beltran, Lidia; Roca Cladera, José Nicasio. 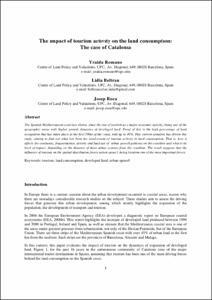 The impact of tourism activity on the land consumption: the case of Catalonia. A: Conference of the International Forum on Urbanism. "6th Conference of the International Forum on Urbanism (IFoU): TOURBANISM, Barcelona, 25-27 gener". Barcelona: IFoU, 2012, p. 1-10.